I’m not superstitious but a lot of people are. And some of those people are Christians. Today is Friday the 13th (of September). To me, it’s just another day of the week to glorify the Lord. For others it’s a day of extra precaution, avoidance or even fear. Studies have shown that there are visible affects to Friday the 13th. For example, Americans spend $800-900 million less on Friday the 13th because people who are scared don’t leave their homes or don’t take airplane flights on this day. In some countries, crime actually goes down on Friday the 13th because, apparently, crooks are pretty superstitious. 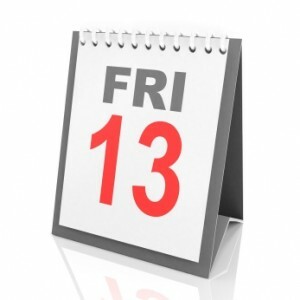 The interesting thing about Friday the 13th is that it has no historical origin. It wasn’t until the 20th Century that there was a phrase called “Friday the 13th.” Most believe that it was an amalgam of two “bad luck” omens based on hyper-religiosity: Friday is unlucky because Jesus was crucified on that day (which I find ironic and misplaced because what Jesus did on Good Friday is the best thing that could ever happen for the human race). “13” is unlucky because it is one more than 12, a number that signifies completeness. Religious folks point to the Twelve Apostles as proof of the divine completeness of the number 12. But it doesn’t seem like it was a very lucky number, as the 12th Apostle was Judas – who killed himself. Then in Acts 1, the Eleven appointed Matthias (the 13th Apostle!) to take his spot. I guess there is a case for Matthias taking the #12 slot. But what do you do about the “Apostle” Paul (the 14th Apostle, or the #13 slot!)? Any way you slice it, it doesn’t seem that Friday the 13th has a whole lot of historical strength to make it as bad as a day that people believe it to be. But try to talk superstitious people out of believing in it! They’ll give you 100 reasons why we all should beware of it. The underlying attitude (and where I am going with this) is fear. Superstitious people are afraid. They’re afraid something might happen to them because of some bad karma in the air. But they aren’t the only ones dealing with fear. I am afraid of some things. I’m fearful for my kids and grandkids. I’m afraid of having to endure a painful disease or condition. Sometimes I’m afraid to walk down a dark street at night. Truth is, we are all afraid of something. We all have fears. And, whether we like it or not, whatever we fear has a certain grip and control over our hearts and lives. So whether our fears are superstitious or whether they are perfectly logical, we’re all in the same boat – we all have fear, and this fear always paralyzes us. The good news is that the Ultimate Fear – that which causes all other fears to tremble – is God. And God so loves you and me. Because of that, we don’t have to be afraid. As 1 John 4:18 says, “Perfect love casts out fear.” And God loves us perfectly! This doesn’t mean Christians live without fear. God does not zap us with “instant courage.” Rather, we learn to face our fears with the presence of God by our side. Sometimes God’s presence gives us peace in the midst of facing our fears. Sometimes, though, we still “feel” the fear as we step into it, but then we see the power of God dispel it as we take steps of faith into the darkness. This is how God gives us a spirit of love, power and a sound mind which overcomes the spirit of fear and timidity (2 Tim 1:7). So to the fearfully superstitious and to the logically fearful, I say let’s be whole life worshipers and walk with God through our fears. For the One called the “Fear of Isaac” (Gen 31:42) is with us and the Darkest of darkness trembles at His Name and at the sound of His voice. Friday the 13th is not a day to be afraid of, but to “live into” – with the Presence of Christ, who makes every day a Good day. Thank you Doug for the readings you do. I find them helpful. Yes, they are always helpful, Doug, even if I don’t always comment. Thank you for sharing and teaching!